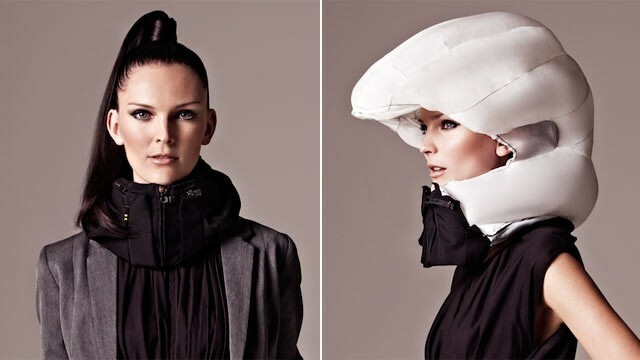 The air bag can inflate and surround your head in 0.1 seconds. A small gas inflator fills it with helium. It needs to be powered on, though -- there is a power button and when it's on, LEDs light up to tell you how much electricity you have to work the inflator. There's also a sound to tell you it is powered on in case you cannot see it around your neck. That means you also have to charge the invisible helmet; it uses a microUSB port and the company says a charge lasts about a month during normal use. And that's not all the tech inside the collar. The helmet has a "black box," similar to ones on airplanes, to record the movements of the cyclist, and recognize the acceleration and angular velocity during an accident. The data is stored in the Hövding so the company can then see what sort of accident it was. Apparently available for 399 euros only in Europe — not available yet in the United States and it's been years! If it works, I want it now, like today. This is a Swedish invention! Let's do a deal! I'll bring you one back from Europe and we talk about #RSS and http://subtome.com on Postheaven!